A-93 pallet strapping machines from Australian Warehouse Solutions are fully automatic, strapping polypropylene at high speeds using little power. Providing a solution for medium volume users that require a machine that can be used on continuous duty, they require no lubrication and perform at a speed of 2.5 seconds per strap. 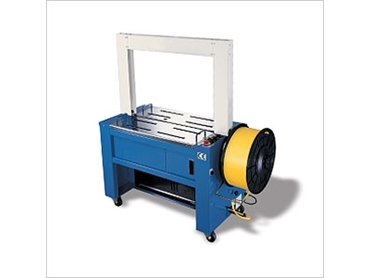 A-93 pallet strapping machines are designed for safety and made to last, encased in an aluminium alloy die-cast main body block and including a floating switch control, emergency stop and motor overheat protection. If raising capital is a problem the A-93 pallet strapping machines are available on flexible rental contracts. Trained AWS staff also offer a free assessment of the individual strapping needs of their clients.